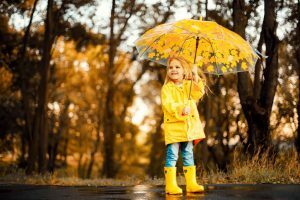 One of the most important decisions when choosing a rain umbrella is whether to buy a compact umbrella or a stick umbrella. With many thousands of umbrellas available, it’s not the easiest of choices. In this guide, we’ll give you all the information you need to decide which type is perfect for you. 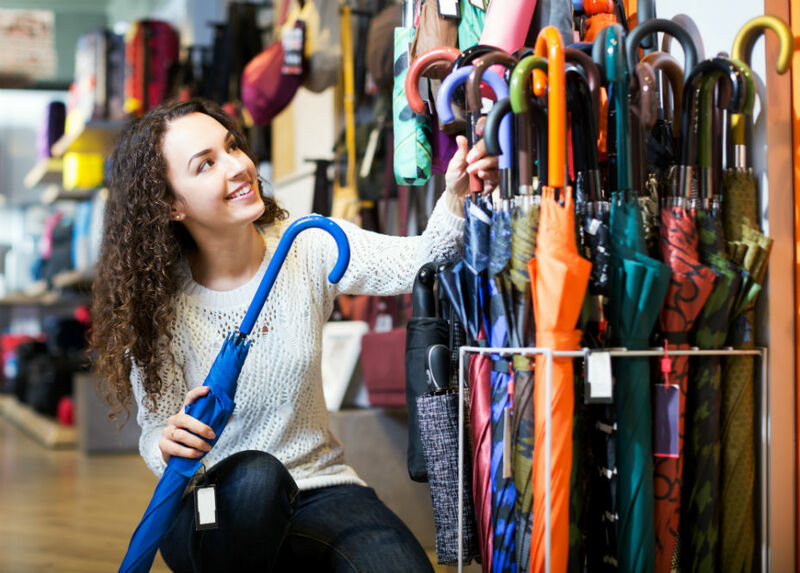 Having researched hundreds of umbrellas, we’ve included our Top Picks in this guide to make your buying decision effortless. A compact umbrella, sometimes referred to as a folding umbrella, travel umbrella or mini umbrella consists of a folding frame and collapsing shaft capable of folding down to a compact size. This style of umbrella actually comes in a huge range of sizes. In the closed position the length of the umbrella can vary from 15cm to over 45cm; the width will usually be between 4cm and 6cm. The majority of compact umbrellas however have a length when closed between 25cm and 30cm. Therefore, one of the key advantages of owning a compact umbrella is clearly its portability, allowing it to be carried in a bag, handbag, school bag or rucksack. 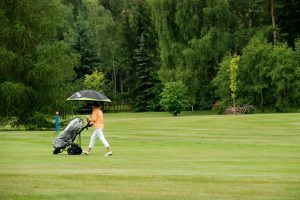 Pay close attention to the length of the closed umbrella to ensure it will fit in the bag you have in mind as umbrellas at the top end of the range, between 30cm and 45cm, will only fit in larger bags and rucksacks. Another consideration regarding portability is the shape of the umbrella when closed. Some models have a cylindrical shape, whereas others have a flat design. Flat umbrellas are great for slipping into a small compartment in a bag or even a coat pocket. Another important factor to consider here is the size of the rain umbrella canopy when the umbrella is open. Canopy size is measured in two ways: firstly using an arc measurement around the curvature of the canopy, and secondly measuring the diameter of the canopy from edge to edge. The arc measurement is usually around 10% to 20% higher than the diameter measurement. 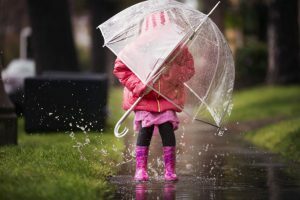 We always recommend using the diameter measure when deciding which umbrella to go for; this is because only this measure gives the actual width under the canopy that will remain dry in the rain. Looking at it another way, if you were to look at the umbrella from directly above, you would not even see the arc of the frame; you would only notice the diameter of the canopy from edge to edge. Compact umbrellas usually have a diameter measurement of between 70cm and 110cm. Our recommendation is to try to achieve a diameter in the top half of this range, i.e. 90cm or above, as this will ensure sufficient coverage to shield the head and shoulders from the rain. Compact umbrellas can also offer enhanced automatic mechanisms when compared to stick umbrellas. They will either be manual open, automatic open or automatic open and close. With the latter design, the umbrella button will deploy the canopy in a fraction of second; however when pressed for second time it will snap the frame closed allowing you to get inside and away from the rain in super-quick time. The shaft can then be collapsed by hand to return the rain umbrella to its fully closed state. Only compact umbrellas have this really handy automatic open and close design. Stick umbrella mechanisms are either manual open or automatic open only. A word of warning however regarding compact umbrellas; they are likely to last you less time when compared to a stick umbrella and there are several reasons for this. Firstly, the maximum number of ribs in the frame on this type of umbrella will usually be eight or nine; indeed some may only have six ribs. 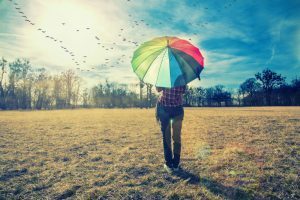 When you consider that a stick umbrella usually has a maximum of 24 ribs creating a super-strong frame structure, a compact umbrella won’t be anywhere near as strong. Secondly, compact umbrellas have more intricate frames and mechanisms, they crucially have more folds and fulcrum points allowing them to collapse down to their small size. Folding umbrellas come in 2-fold, 3-fold, 4-fold or 5-fold designs. Therefore a 2-fold umbrella folds into two parts, a 3-fold umbrella folds into three parts, a 4-fold umbrella folds into four parts and a 5-fold umbrella folds into five parts. The majority of compact umbrellas have a 3-fold design meaning that an 8 rib model will have 24 folds together with a large number of connecting components. As a result, there are many more parts that can break either in bad weather or simply through wear and tear. A further consideration here must also be price. Compact umbrellas can vary hugely from under £10 (EUR 12 or US$16) to over £50 (EUR 60 or US$65). Our research has found that spending between £20 (EUR 24 or USD 26) and £30 (EUR 36 or US$39) on a compact windproof umbrella, can secure a model that is built to last and if, heaven forbid, you lose the umbrella, it doesn’t mean you have to remortgage your house. 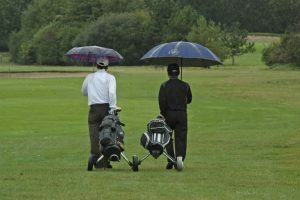 A stick umbrella, sometimes called a walking umbrella or golf umbrella, is made of one continuous shaft and will be significantly longer than a compact umbrella when closed. It will usually have a length between 80cm and 110cm in the closed position with a width of around 5cm or 6cm. A key advantage of a stick umbrella is that it is very likely to be a stronger umbrella when compared to a compact model. The frame of a stick umbrella is simpler as it has fewer fulcrum points and components. Materials used to construct the frame are typically steel, fiberglass, aluminum or plastic. When the umbrella is opened, the ribs simply move from the vertical position to their horizontal arc position without the need to unfold. This is only possible due to the length of the closed umbrella which allows the ribs to be stored in their full length without being folded. As a result, with no folds and no associated weak points, the umbrella will be stronger. 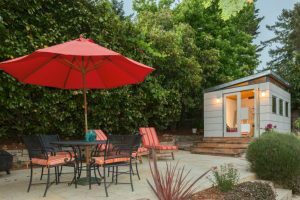 We recommend a frame made of steel or fiberglass as they create the strongest structure. Therefore if you’re looking for a stronger rain umbrella more capable of standing up to bad weather and storms, always consider a stick umbrella. It may mean you have to carry the windproof umbrella, however it should last you much longer and therefore save you money in the long run. Canopy size is another great reason to buy a stick umbrella. 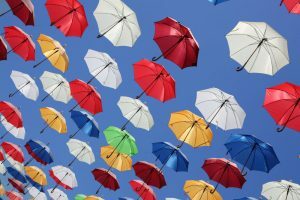 While compact umbrellas typically have a diameter measurement of between 70cm and 110cm, stick umbrellas usually have a diameter measurement of between 90cm and 130cm, giving much better coverage. You can expect to achieve 20% more coverage on average when compared to compact models and over 40% more on the largest models compared to the average compact umbrella. We recommend a diameter of at least 95cm to cover one person and a diameter of at least 120cm to cover two people meaning a stick umbrella also gives the option of protecting two people from the elements. Turning to the handle of the umbrella, this is usually superior on a stick umbrella. Firstly and most importantly, handles are often significantly larger on this style of windproof umbrella. Larger handles are easier to hold and crucially fill the whole hand. 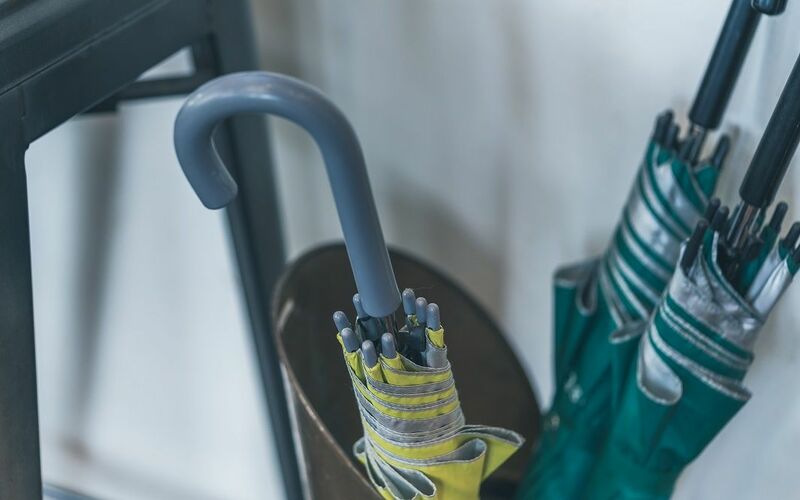 Compare this to some compact umbrella handles that can be just a few centimeters in length and can cause discomfort when gripped tightly for even a short period of time. 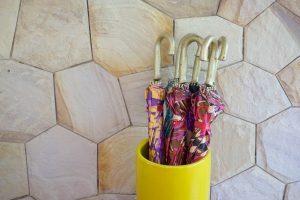 Additionally, stick umbrellas often have a hook-shaped handle which can be a great advantage; they look great and are very comfortable to hold when the umbrella is both open and closed. Hook handles are rarely used on compact umbrellas as they add bulk to the umbrella and thus make it more difficult to store in a bag. Another feature of a stick umbrella is the greater curvature of the canopy compared to a compact umbrella. 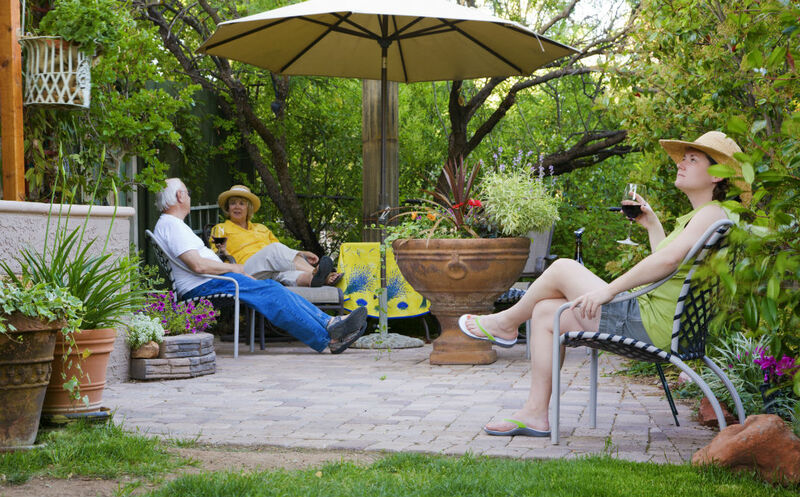 Typically, you’ll find a compact umbrella has a flatter canopy; this arises due to the mechanics of the folding frame and the need for the fulcrum points to lock straight in the center section of the frame. Only at the edges of a compact umbrella canopy can more curvature be achieved with more flexible outer ribs. In contrast, stick umbrellas have continuous ribs capable of flexing to achieve increased curvature giving a greater depth to the canopy. Having a rain umbrella with this increased curvature has a big advantage of adding strength to the canopy and allowing it to retain its shape even in strong winds. It also gives greater protection to the head and shoulders. Compact umbrellas with flatter canopies are more likely to “flip” inside out in a strong gust; however, stick umbrellas with more curvature and depth to the canopy are much harder to flip inside out and invert. A word of caution; take care when considering the price you wish to pay. Stick umbrellas vary greatly in price from just a few pounds/euros/dollars to over £100 (EUR 120 or US$130). Although you might be tempted to pay just a few pounds/euros/dollars for a stick umbrella, assuming it will be stronger than ANY compact umbrella, this is definitely not the case. The very cheap umbrellas are made from inferior components and can quickly fail even in moderate winds. We recommend spending between £25 (EUR 30 or US$33) and £35 (EUR 42 or US$46) to secure a strong and reliable model that is built to last. You can store in a bag, rucksack etc.